The shoebill is a large, elusive, stalk-like bird with an almost prehistoric appearance, due to its oversized shoe-shaped beak. They are sometimes referred to as ‘Whalehead‘, for obvious reasons. 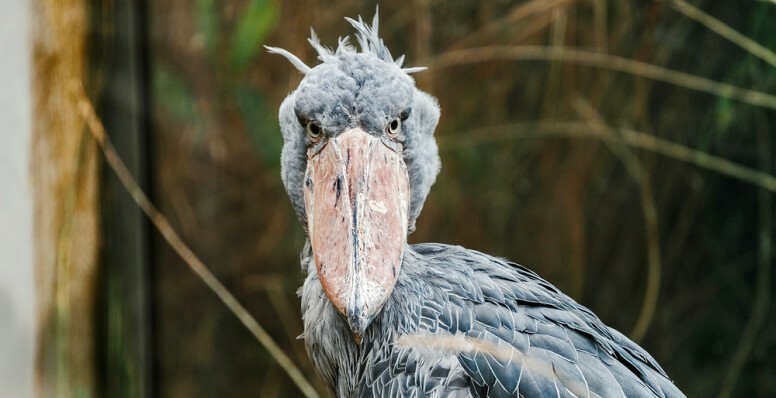 Shoebill inhabit East Africa, in freshwater swamps and marshes of Uganda, Sudan, eastern Democratic Republic of the Congo, Zambia, Kenya, Ethiopia, Botswana and Tanzania. It’s distribution is often close to the presence of papyrus vegetation, and lungfish. Location: East Africa – Uganda, Sudan, eastern Democratic Republic of the Congo, Zambia, Kenya, Ethiopia, Botswana and Tanzania. Diet: Mainly fish. Occasionally frogs, snakes, snails, rodents & even baby crocodiles. Shoebill were previously thought of as storks, but genetic research has re-classified them as members of the order Pelecaniformes and family Balaenicipitidae, which are large waterbirds, genetically closer to pelicans and herons. The shoebill is piscivorous, primarily eating fish – in particular lungfish, as well as bichirs, tilapia and catfish. However, it does occasionally hunt and eat other prey, such as frogs, lizards, watersnakes, snails and rodents. The shoebill is an extremely tall bird, with long spindly legs, that allows it to stand in the shallows of swamps and on aquatic vegetation, while hunting for food. The shoebill averages between 3.5 – 4.5 feet (1 – 1.4 meters) in height, and weighs between 9 – 15.5 pounds (4 – 7 kg). It has broad wings, with an average wingspan between 7.5 – 8.5 feet (2.2 – 2.6m). The shoebill population is particularly difficult to evaluate with accuracy, due to where they habitat and their elusive nature, but it has declined – with estimates between 5,000 – 8,000 in total. BirdLife International has classified it as vulnerable, due to habitat destruction, disturbance and hunting. Shoebill have specific habitat requirements for breeding, nesting and hunting, and their swamps and marshes are gradually being transformed into agricultural land, or pastures for cattle grazing. 1. If you hadn’t noticed, they are unusual and almost dinosaur like in appearance. At times, and from certain angles, they can appear rather menacing, peering down their long, razor sharp beak, with a hook at the tip. They can also be extremely cute, and almost ‘cartoon-like’. They have striking pale, blue-eyed genes, which can make them appear not really real. They are truly unique and beautiful birds. 2. The shoebill’s flapping when flying is one of the slowest of any birds, at a mere (approx.) 150 flaps per minute. Only larger stalk species have slower flapping than the shoebill. 3. They have the 3rd longest beak in the world, which enables them to hunt extremely large prey, even baby crocodiles. Their beaks can reach up to 24cm in length and 20cm (7.4 to 9.4 inches) in width, which helps them hunt for fish or snakes as long as 3.2 feet (1m) in size. 4. The razor sharp edges of it’s beak, allow it to decapitate their prey quickly. 5. 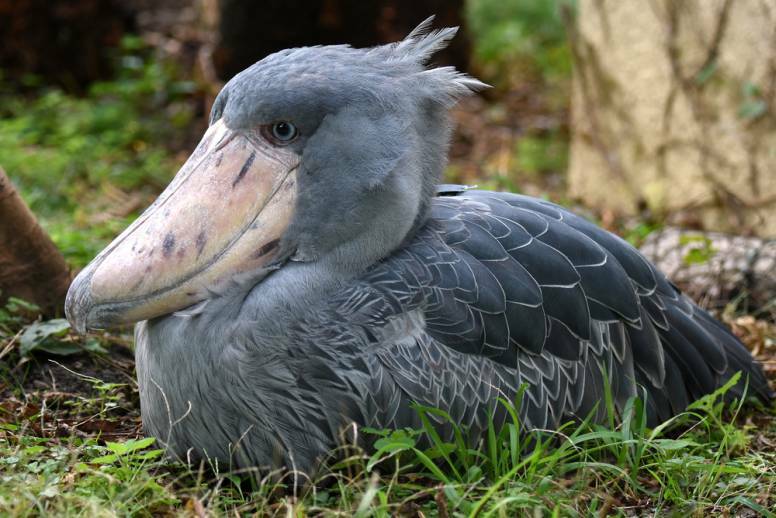 A shoebill can often benefit from the presence of hippos, which disturb fish, and bulldoze paths through swamps. The shoebill can take advantage of the disturbed fish in the water and strike. 6. A shoebill is an ambush predator, which often stands still for long periods, motionless like a statue, before launching a vicious attack to kill any prey that come within strike distance. The shoebill often feeds at night, and is also known to stand on floating vegetation to hunt their prey. 7. The shoebill favours areas of poorly oxygenated water. This causes the fish living in the water to surface for air more often. Which increases the liklihood of the shoebill striking and capturing its prey. 8. The Shoebill is usually silent, but they are known to clatter their bills loudly during courtship or greeting, which can sound a little like a machine gun. Bill-clattering is a behaviour of real storks. They can also let out a high pitched whine, and even make cow-like ‘moo’ noises. 9. Shoebill are solitary in their breeding habits, with typically less than 3 nests per square kilometer. The nesting shoebill will vigorously defend their territory between 2 – 4 square kilometers (1 to 1.5 square miles) from other shoebill, and large birds. 10. Shoebills chicks often bully, fight and can kill their siblings (known as ‘siblicide’) when only a few weeks old. 11. The shoebill female always lays two eggs, but only one ever survives. 12. The Shoebill has long fascinated civilizations. They appear in wall paintings and hieroglyphics of ancient Egyptians, and it’s old Arabic name is Abu-markub, or ‘Father of a Slipper’. This name is in reference to the birds very distinctive beak. 13. Sadly, the demand for shoebill birds in zoos, or for private collectors is extremely high. There are reports that they can sell for US $10,000-$20,000, making them the most expensive birds in the zoo trade. 14. They are incredibly rare, that birding enthusiasts have to pay local expert guides to go on specialist shoebill tours and safaris, to try and get a glimpse of the elusive, sought after birds in the wild. This involves going way off the beaten track and into the swamps which they inhabit. R. Pope (2016). 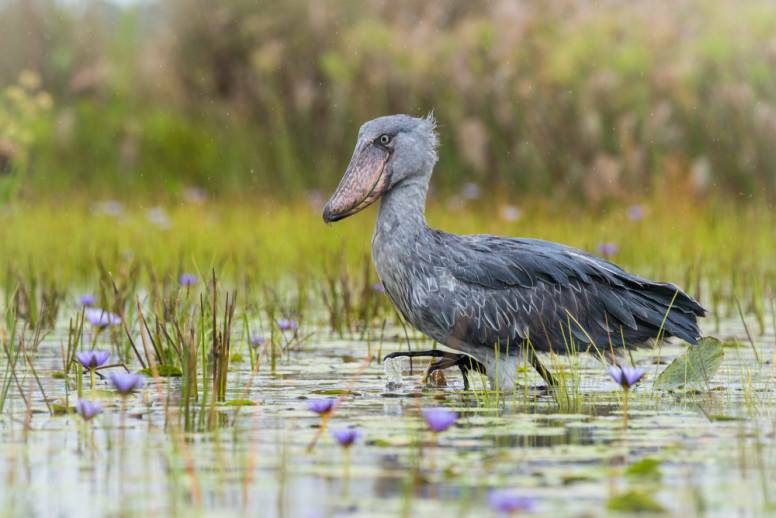 “5 Facts You Didn’t Know About Africa’s Shoebill”, via Zambia Tourism. 2013, “Monster Bird Reveals Dark Side”, via BBC Nature. 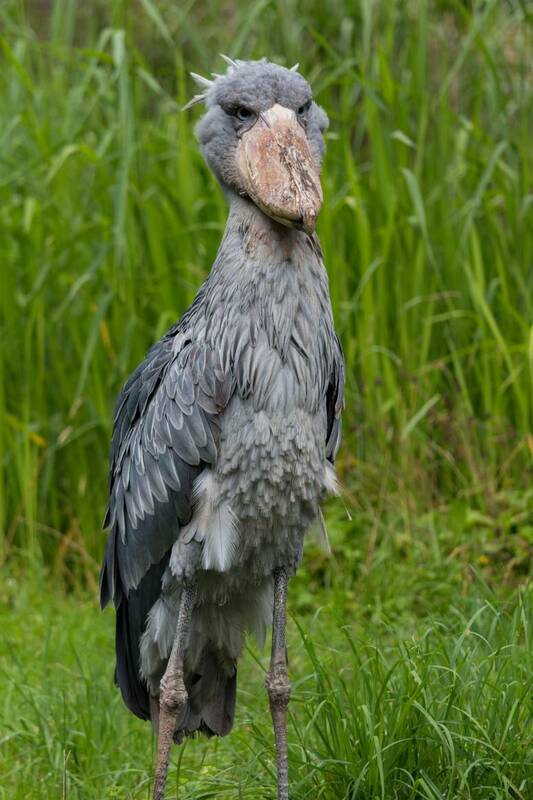 A. Steffen, “Balaeniceps rexshoebill”, via Animal Diversity.